Whether you're looking for marketing services, strategy or just getting started, we have a solution for you. We'll help you grow, faster. We’re not your traditional digital marketing agency. We’re not satisfied with doing the bare minimum. We’ll set you up with a specialist. Not an account manager. Want digital marketing insights delivered straight to your inbox? Subscribe to the Single Grain blog now for the latest content on SEO, PPC, paid social, and the future of online marketing. I consent to receive email messages from Single Grain. NOW WITH MORE! This post has been updated to include a short video tutorial on creating a sales funnel to get you ready for 2019. Enjoy! What is a marketing funnel? No, it’s not what you use for cooking. We’re talking about the kind of funnel that you absolutely must get right if you want your business’ sales process to run as efficiently as possible. Basically, your marketing funnel is made up of several stages through which would-be customers move from first awareness of your brand to post-sale evangelism. It’s the process of converting a visitor or browser into a paying customer. Think of pouring rice through a funnel: a lot goes into the top but only a trickle comes out the bottom. That’s how leads pour into a funnel: a lot of interested people go into it, but a much smaller number of people come out the other end — with your product in their hand. 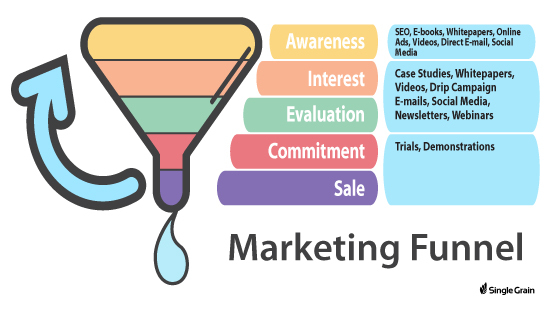 What is a marketing funnel? A marketing funnel is a way of breaking down the customer journey all the way from the “awareness” stage (when they first learn about your business) to the “purchase” stage (when they’re ready to buy your product or service). First, you want to attract awareness to your business by ranking high in search, publishing white papers, etc. As leads progress through your funnel, your outreach methods will get more and more personalized (sometimes involving a product demo or a phone call) until the sale takes place. Free Bonus Download: Don’t reinvent the wheel – use this marketing funnel worksheet to get a 50,000 foot view of your customer’s buying journey. Click here to download it for free right now! Norman Newbie owns a software company with ten salespeople and one product. He’s not a very savvy marketer, so his sales process currently involves handing his salespeople lists of leads that he purchased online and having them “dial for dollars.” His salespeople frequently get frustrated since his leads aren’t always good quality. Because they’re usually calling on people who A) aren’t interested in his services and B) are not a good fit for them, the salespeople close less than 1% of the prospects they initially reach out to. Molly Marketer has a similarly-sized company, but instead of taking Norman’s traditional outbound marketing approach, she’s created a marketing funnel that helps her three salespeople close more sales with less effort. Molly started by building a series of attention-grabbing content marketing pieces that are tied to landing pages on her website. Potential customers can engage with her content (blog posts, infographics, videos) and learn about her company and its services without a cold call from a salesperson. Obviously, these are simplified examples, and most businesses will fall somewhere in the middle of this “0 to 60” spectrum. Even if you’ve never heard the phrase “marketing funnel” before, make no mistake about it: you have one. Whether you’re an old hand looking for fresh ideas on optimizing your current funnel or a newbie wanting to learn how to make an effective marketing funnel, you’ve come to the right place! Here is a compilation video of 6 marketing funnel strategies from Growth Everywhere episodes. Understandably, if a person doesn’t recognize that she has a need that must be filled, she’s not going to make a purchase! That said, these needs can range from obvious, easily-solved problems to issues without clear solutions. Suppose your furnace goes out in the middle of winter. Your problem is obvious: you need a new furnace. And the solution is easy — you need to call HVAC providers in your areas for quotes. But say you need a new car. Should you look for an SUV, a compact car or a mid-size sedan? Even vaguer still, if you’re frustrated with how much your accountant is charging you to do your business’ taxes, you might not even be familiar with all the different solutions, like cloud-based accounting services. For different types of businesses, buyer needs at the problem/need recognition stage would be different. For example, if you’re running a consulting business, then at the very beginning, your clients would realize that they’re having certain problems around your service area – like a high cost per lead (if you’re in marketing), disorganized spending (if you’re in accounting), etc. This emotional state is important because it’s the state buyers will be in when they look to buy your services. According to Pardot, 70% of buyers turn to Google at least 2-3 times during their search to find out more about your business, their problems or solutions, etc. For example, at this stage, buyers would be most interested in tactical content they could use to solve their problems. If you’re in marketing, you might create content around link building, SEO, Facebook advertising, or any other strategy that your customers would be searching for. If you’re in accounting, you might create content around helping solopreneurs figure out their finances for the first time. You can do some keyword research to figure out what types of content you should be creating — you can find out which search terms in your niche get high volumes of traffic, and create content around some variation of those keywords. But say you’re evaluating marketing automation programs to help improve the sales funnel you’re creating. Because these programs can require investments of $1,500 a month, you’re likely to undergo a much more careful and thorough evaluation process. You might request free trials of the different systems you’re considering, have online demonstrations with each company’s representatives or view training videos to get a feel for how each system will perform. If you’re running an accounting business, at this stage, your customers would be evaluating different potential service providers. They might need resources like pricing guides (so they know what ballpark rates are), how to evaluate the landscape of accounting services (i.e. whether to hire a solo accountant, an agency, etc), or how to choose an accountant. If you’re running a marketing services business, you might create content about how to choose a marketing agency, pricing guides, whether a company should go contract or hire in-house, etc. At Single Grain, we’ve created content resources around this for companies that are considering hiring marketing agencies. The purchase decision is the natural conclusion of the preceding three stages. You determine that you have a problem, investigate your options, decide which one is best for you, and then pull the trigger. However, businesses need to be aware that there are two things that can disrupt this stage: negative feedback from fellow customers and the prospect’s motivation to accept this feedback. At this stage, the content you’d need to create would be content that helps your buyers feel confident that the decision to purchase is the right decision. For example, you could create case study content that showcases a success story a previous customer had, and what new customers could potentially expect. It’s important to create case studies with customers that reflect different customer “profiles” or demographics. This will help persuade people that your product will work for their specific situation. Finally, don’t think that the sales process is done just because a purchase decision has been made. What happens after the sale has been completed is just as important as what went into bringing about the sale in the first place! There’s not much content you can create to help facilitate a good post-purchase experience — apart from just creating a great product. If you have a great product that solves a problem, post-purchase behavior will take care of itself. There are certain pieces of content you can do to help facilitate better post-purchase behavior. 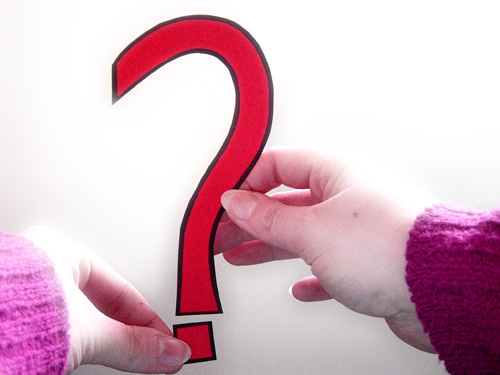 For example, you could create FAQ content, make it easier to get support, etc. Although most people enter the funnel at the top — the “problem/need” recognition section — not everyone does. Some will enter at subsequent stages, but the process remains the same no matter which stage someone enters the sales funnel. As you can see, each color-coded piece of the funnel pictured above roughly corresponds to stages 2-4 in the buying process. The widest tier at the top of the funnel represents “awareness,” the point at which potential customers are beginning their information search. The second tier is “consideration,” roughly corresponding to the evaluation of alternatives described in the purchase process above. And finally, the third tier, “decision,” is self-explanatory. As a note, stages one and five have been left out of this model. Though all companies should have a plan for addressing post-purchase follow-up, it’s up to you to determine whether or not it’s worth your company’s time to try to reach buyers in the first stage of the process. It can be difficult to convince people that they have a problem if they haven’t already felt it themselves, but if you’re selling a new type of product that meets a previously unrealized need, you might want to focus your energy on this area. How will customers at this stage find me? What kind of information do I need to provide to help them move from one stage to the next? How will I know if they have moved from one stage to another? Because Norman sells a high-dollar software product that meets a need that most businesses are familiar with, he decides that it’s easier to focus on attracting and converting customers who already know that they need his product, rather than trying to create the need in the first place. If he was a startup or a company with a new idea, he might choose to invest more of his time and energy here. What kind of information do customers at this stage need? Content that introduces the company and intrigues the potential customer enough to move to the next stage of the buying process (for example, Facebook posts on “Behind the Scenes at Norman’s Company. How will I know if customers have moved on to the next stage? Norman will know when customers have moved on to the “Evaluation of Alternatives” stage when they request a free online demonstration, indicating that they are interested enough in the product to compare it against others. Most prospects will enter this stage after identifying Norman’s company as a possible alternative and completing the information search process described in Stage 2. However, some customers might be introduced to his brand after completing Stage 2 with his competitors, as in the case of an industry blog running a comparison chart of the different competitors in his space. As a result, Norman decides that it’s prudent to set up Google Alerts for his competitors’ names. Whenever they appear online, he makes it a point to try to get his company mentioned as well by reaching out to publishers, leaving comments, and responding to questions he sees about his competitors. What kind of information do customers need at this stage? What differentiates Norman’s product from his competitors’ products? Instead of relying on external sites, Norman could create his own product comparison chart showing how his product is different from others. Have other buyers been successful with Norman’s product? Case studies of past customer successes can be extremely helpful in terms of moving customers from the evaluation stage to the purchase decision. Why should they purchase from Norman? To meet this need, Norman might publish a white paper based on primary research he’s conducted that establishes himself as an industry authority (or, better yet, he might place this behind an opt-in form that causes visitors to take the psychologically-compelling step of engaging further with his brand). Visitors who move on to the next stage are those that make a purchase, so any indication that the buying process has begun means success — from verbal confirmation of a deal’s acceptance to the receipt of a formal contract. However, if Norman uses an online shopping cart system, he might also find it useful to track abandonment rates, as reaching out to these customers could help reveal reasons visitors aren’t progressing to the next stage or provide salespeople with leads that can be easily closed with a single outreach phone call. Customers at this stage will have already found Norman’s company by progressing through stages 1-3. There is no extra outreach Norman needs to do at this point, as it is exceedingly rare for customers to purchase without conducting any type of information search or comparison of alternatives. Since Norman is selling a high-dollar product, he needs to do two things: help prospects be comfortable with the purchasing process and make the purchase process as easy as possible. To help make customers comfortable, he decides to create a few blog posts on what happens after the purchase is completed to ease potential worries about investing with his company (for example, “10 Ways Norman’s Company Simplifies Software Onboarding”). To minimize confusion, he adds information to his checkout pages in order to make it as obvious as possible what prospects should do next in order to purchase his solution. Customers will move on to Stage 5 when the sale is complete. Although we won’t detail it here, Norman should brainstorm the kinds of information these customers will need, as well as how he’ll provide it as part of a cohesive onboarding process. Though he doesn’t need to worry about customers finding him at this stage or moving on to the next one, it’s still important to meet their needs so that they walk away feeling good about their purchase decisions! Since this is a significant amount of content, Norman can choose to roll it out over time, enlist other employees in the creation process or outsource some of it to freelance workers. Free Marketing Funnel Map: Get this FREE resource on how to map out each stage of your marketing funnel. Click here to download it free. Attention: This is similar to the problem/need recognition stage. Customers experience a problem, but must recognize the problem. You create content to draw attention to the need. Action: Now it is time for customers to make the purchase decision, or to take action. Make it easy for them to say “yes” to taking action. Have a strong call to action in your copy, and a simple path to follow to complete the sale. The easier you make it for people to take action, the more sales you’ll generate through your sales funnel. Whether you prefer the traditional sales funnel stages or the acronym AIDA, the results are the same: customers enter the sales funnel and through a process of discernment, choose to either move to another solution or purchase from you. 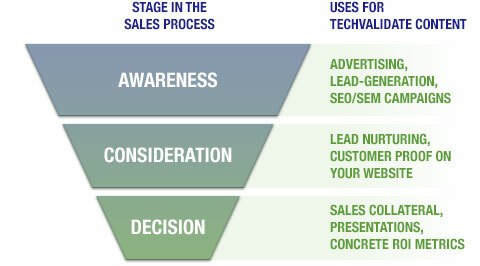 The action at the end of the funnel, or the purchase, concludes the stages of the sales funnel. [Podcast] What Part of Your Funnel Should You Focus On? A marketing qualified lead (MQL) is a prospective customer who has demonstrated a particular level of engagement that leads the marketing team to conclude that real sales potential exists. The level of complexity involved in this assessment will vary based on the resources available to the team. Norman, for example, might conclude that anybody who fills out his online demonstration request form is an MQL. A company that’s using a marketing automation program might be able to set the bar to MQL qualification at something involving a combination of viewing specific pages, interacting with certain forms, and opening a certain number of email messages. Once an MQL has been identified, it can be passed on to the sales team for future follow-up. Salespeople can then further qualify the lead by measuring two things: interest and fit. Interest, as you might expect, refers to how invested the prospect is in moving forward with your company’s type of solution. Fit refers to how closely the lead matches your company’s definition of an ideal buyer. Low interest and low fit – The leads don’t meet your company’s target criteria and are unlikely to make a move soon. A common example of these types of leads is the low-level employee who’s browsing solutions out of curiosity, not an immediate need. High interest and low fit – These MQLs are often people who are searching for a solution, but are unlikely to ultimately go with yours. If, for example, you sell a cloud-based software program and the prospect will clearly be more comfortable with a desktop solution, you could be dealing with this type of MQL. Low interest and high fit – Typically, these leads closely resemble your target customer, but aren’t actively seeking solutions. Even though they may not be a good fit right away, it may still be worth pursuing them to create brand awareness that will pay off down the road when their need becomes apparent. High interest and high fit – These MQLs are the “sweet spot” of people who are actively seeking your type of solution and are likely to convert to buyers. These leads should be the highest priority of your sales team. When a salesperson qualifies a lead and deems it likely to eventually lead to an opportunity, this becomes a sales qualified lead (SQL). Again, it will be up to you to determine exactly what constitutes an SQL. Norman, for example, decides to send every MQL through to his salespeople for qualification because he runs a small company with a single tier of sales reps. A larger company with both junior and senior sales representatives may, on the other hand, choose to have junior representatives conduct initial calls to qualify prospects before assigning only those that fall into the “high interest and high fit” category to senior reps for online demonstrations. The specifics of each stage of qualification aren’t particularly important. What is important is that you assign them in the first place! Not only will this help you to identify the content pieces that are leading to the most new prospects (as well as any additional pieces that should be created), it will ensure that you’re using your salespeople’s time effectively. So now you’ve created your funnel and defined exactly how your personnel will interact with it. The final step in the process is to figure out which metrics you’ll track to determine how well your funnel is functioning. For that reason, while you might want to experiment with tracking all the different metrics below (or any others that you think could be valuable), it’s best to choose a core 2-5 to focus your attention on. You can always add more later, but be sure you’re actually making changes based on the data you generate from these few metrics before expanding your data operations. Sales funnel conversions – If you’re going to choose only a few metrics to focus on, make sure this is one of them. Essentially, this metric involves tracking the number of prospects that enter your funnel at any point and then convert into customers. As you make changes to your marketing strategy in the future, seeing this number improve will let you know you’re on the right track. Entry sources – Monitoring the sources from which people are entering your funnel can be useful data to track, as it gives you ideas for expanding the reach of your marketing campaigns. If, for example, you see that a large number of your prospects are coming from a single guest blog post you did, seeking out similar guest author positions can be an easy way to increase your overall sales. Exits from stage – Similarly, seeing an excessively high number of people falling out of a particular stage is an indication that you aren’t doing enough to answer their questions. Add more content to give them the information they need to move forward. Content piece engagement rate – If you have calls to action on multiple blog posts or other on-site content pieces, you’ll want to know which are sending the most converted customers through your funnel so that you can replicate your success with future releases. Tracking engagement rates on each call to action will give you this information. Opportunity arrival rate – Opportunity arrival rate refers to the number of opportunities that are currently in your funnel. Track this rate and see how changes to your marketing strategy impact it. Ideally, you’ll see positive increase in the number of opportunities you’re able to generate. Close rate – Your close rate (or “win rate”) refers to the number of these opportunities that turn into eventual sales. If your close rate is lower than you expect, look to some of the other metrics you’re tracking for ideas on improving the success rate of your marketing funnel. Want to get personalized, specific ideas of how you can build a marketing funnel for your own business? Click the green button below to book a time to chat with us. Eric Siu is the CEO of digital marketing agency Single Grain, which has helped venture-backed startups and Fortune 500 companies grow their revenues. He's also the founder of the marketing podcast, Growth Everywhere. Think you've got a fresh perspective that will challenge our readers to become better marketers? We're always looking for authors who can deliver quality articles and blog posts. Thousands of your peers will read your work, and you will level up in the process. Is Content Marketing the Future of SEO? Single Grain is a full-service digital marketing agency which helps great companies grow their revenues online. © 2019 Single Grain. All rights reserved. Single Grain team has been instrumental in providing us with forward-thinking, growth-impacting marketing support. Their expertise has helped Nextiva grow its brand and overall business. What kind of help do you need from us? ...expect a quick reply from our team soon! Let us know what topics are interested in. What other topics are interested in? How would you like us to help you? We have put together an entire course on how we gained clients like Uber, Amazon and Salesforce using content marketing frameworks that you can duplicate. Single Grain will help build strategies and/or consult with you or your team to set you in the right direction for long term growth. Execution is not included. Single Grain will customize and execute a marketing campaign for you. Let us innovate and come up with the ideas and then do the work for you so you can focus your efforts elsewhere. We’ve helped Fortune 500 companies, venture backed startups and companies like yours grow revenues faster.